We began the day by looking at some of the sights of Kirk­jub­æjark­laustir itself. This didn't take long. 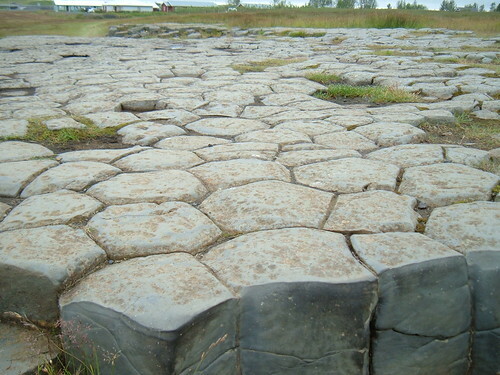 We started with Kirkjugólf, a level surface which is made from the top of buried basalt columns. This , early settlers believed, was what remained of an earlier church floor, hence the name. 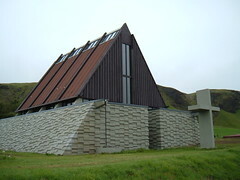 We had a look at Systrapapi, and then at the local church, the Steingrímsson Memorial Chapel. This is named for the local rector, who, during a volcanic eruption, lectured in the church. When the lava stopped short of the town he was creditted with saving the town. One wonders how many other rectors have tried that and had their town destroyed.... we don't hear of the failures, do we? We refuelled and got provisions, then headed west. Our next stop was Vík í Mýrdal. It's a tiny little place, but compared to the road to the east, it's a heaving metropolis! Our first stop was a quick look in the wool shop, and we had a snack, then it was time to explore. We spent quite some time there, walking along, looking at the puffins and the scenery. In the rocks there was much evidence of past volcanic activity (quite apart from the sand colour). Nice place to walk. 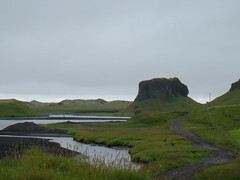 Nevertheless, we returned to the car and drove around the headland to Reynisdrangur itself. 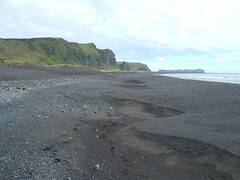 This connect to an outcrop called Dyrhólaey by a long sandbar. 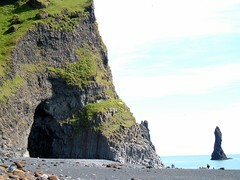 At Reynisdrangur there are great basalt columns around shallow (but tall and wide) caves. 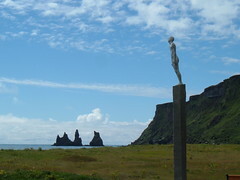 One can also see the other side of the sea stacks. The basalt columns are huge in scale, and are quite easy to climb - but it's quite a different matter coming down, so be careful! Look for the people in the photos to get a sense of scale. 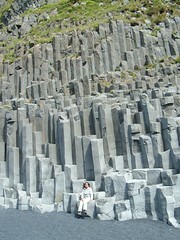 There is a cave there whose roof consists of these basalt columns, it has a beautiful quality about it. It was fairly quiet for our visit, though as we were leaving, a coach party was arriving, a close shave. 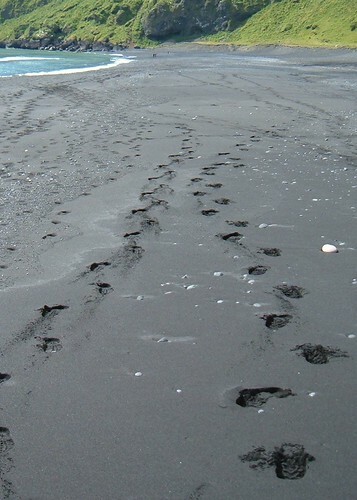 We continued around the coast for a bit more on Highway 1, and took the next turn for Dyrhólaey. 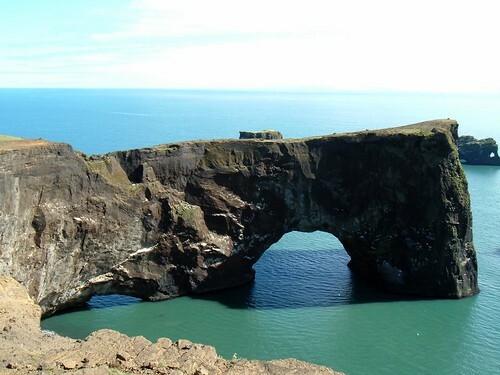 Dyrhólaey is only accessible outside of the bird breeding season, so check the dates if you're really keen to go there. At the turning, we saw a couple of very friendly icelandic horses, and spent some time looking at them. We drove to Dyrhólaey, and took the road to the top of the hill. This is doable in a regular car, but I wouldn't attempt it in anything less than ideal conditions, a few places could be hairy in the wet. 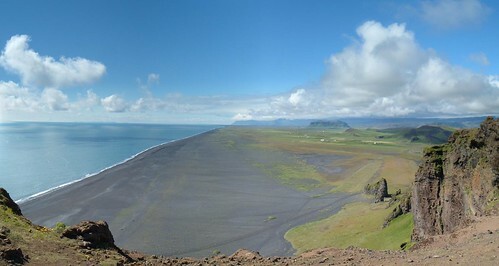 There is a lighthouse at the top, and the views are fantastic, across to the east one looks back to Reynisdrangur, and to the west is an expanse of black sand, stretching off into the distance. 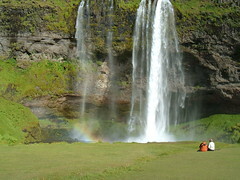 Driving onward to Selfoss, we stopped again at Seljalandsfoss, which this time was to the right of the road (blink and you miss it). 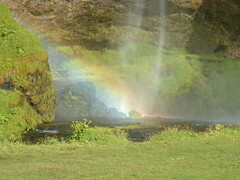 This time we had sunny weather, and so there were rainbows in the spray of the waterfall. 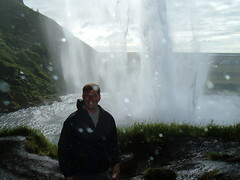 I decided to walk behind the waterfall (Monica left me to it). I emerged quite dry (there is a light spray back there, nothing too bad). It's a bit steep in a couple of places, and a little slippery too, so taking care was the order of the day. It's a really nice spot to break a journey. For our evening meal, we decided to head for a 'Viking Restaurant', just west of Selfoss. It's mentioned in the Lonely Planet guide. it's a little touristy, perhaps, but we fancied a bit of a laugh. We found the place with no problems, a few km out of Selfoss there is a small road heading north, and it's a few km up that road. The directions in the Lonely Planet were very good. It's a grass roofed dining hall, but when we went in, it was abandoned. The place was wood panelled with long benches, a real cliché, but clichés can be a lot of fun if they're well done. So thus it was that we found ourselves eating Thai food, in Iceland, whilst listening to the sound system playing Robbie Williams singing 'Mack the Knife'. Before coming to Iceland, I was quite keen to try 'lundi' (puffin). No luck yet... I had high hopes for the Viking Restaurant. I was not to get the opportunity at all. The cute birdie things survive for another day.